This whale craft mobile has a 3 dimensional underwater effect thanks to the way the plates bend. Read the story of Jonah and the Whale to refresh your memory and review some discussion points. 1. 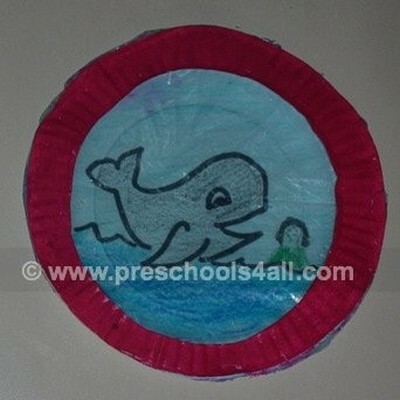 Draw a picture of Jonah and the whale on one paper plate. 2. Cut out the inside of the second paper plate. (leaving just the rim around). 3. Place the blue cellophane paper between the plates. 4. Staple the edges of the paper plates together while stretching on the cellophane paper.